This is a guest post by my friend Angie. 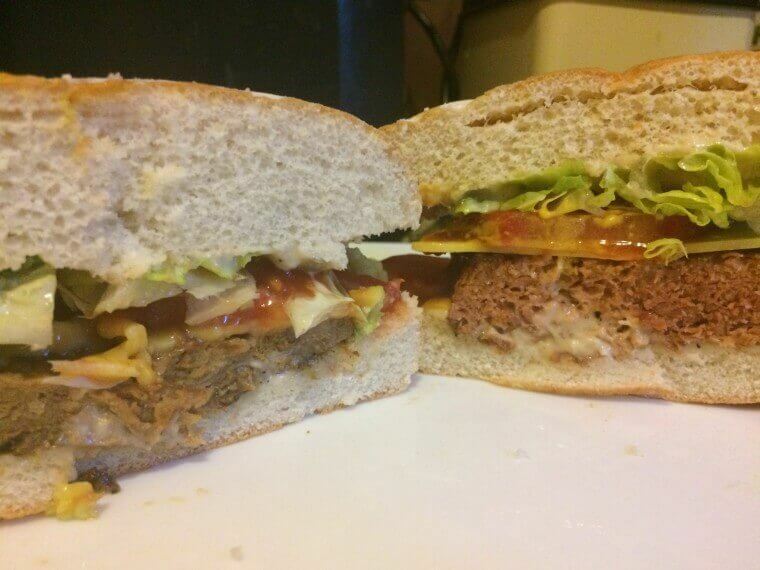 Recently “for science” 🙂 she did a comparison of the Gardein Beefless Burger (my favourite burger) and the Beyond Meat Beyond Burger and posted it to a Facebook group. 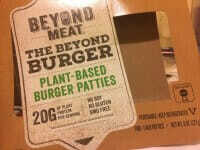 I was unable to do the comparison taste test because Prahran Convenience had sold out of the Beyond Burgers in a very short time. I asked her if I could reproduce it here and she said yes. Currently the burger is for sale at Prahran Convenience (when it is available). Lord of the Fries are also going to introduce it as well. 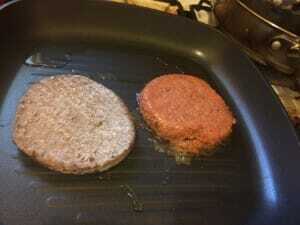 In all photos the Gardein Burger is on the left. 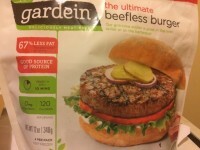 I’ve just completed a comparison between Gardein’s The Ultimate Beefless Burger vs Beyond Meat’s The Beyond Burger. For science! Both burgers were cooked as per the packet directions and served on a damper bun with Daiya Homestyle Ranch Dressing, lettuce, tomato, an Oliana Cheddar cheese slice, tomato sauce and American mustard. Nutrition – Winner = Gardein based on less calories and fat. Taste – Winner = IT’S A TIE! Without a doubt the Beyond Burger looks, cooks and feels like a burger. At $6.97 a patty they ain’t cheap, but they are much bigger (and have more cals and fat). 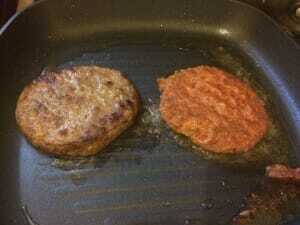 The Gardein burger looks very average in both it’s raw (frozen) and cooked state by comparison. They’re only $2.35 a patty. They are smaller than the Beyond and have much less cals and fat. It’s surprising to me that the taste of these burgers is so similar. 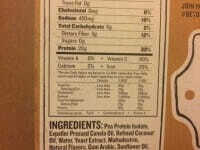 In fact I’d even say the Gardein has more of a ‘flavour’ to it than the Beyond. 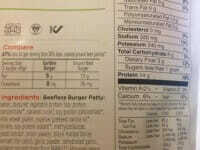 All things considered the Gardein just wins for a good tasting standard burger at a fair price. The Beyond Burger would be worth splashing out on if you wanted to impress someone you might be cooking it for. 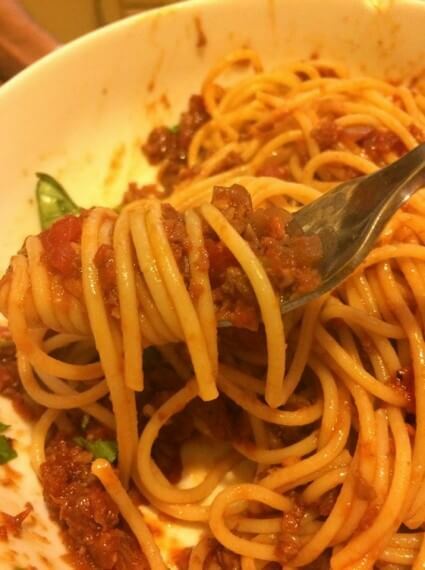 About a week later Angie used the Beyond burger to make spaghetti bolognese. When I asked her if it was good, her reply was “Yes!! Yes!! Yes! !” 🙂 That’s another plus for the Beyond Meat Burger.